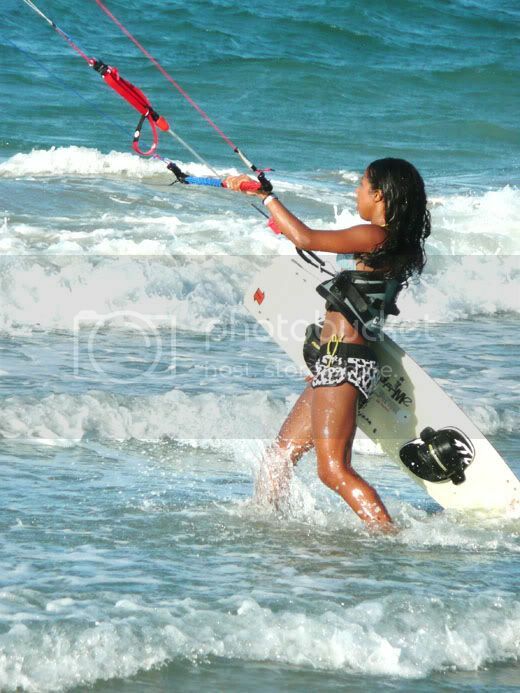 She is half French and half Bajanm but one complete lovely kitesurfing girl! Why kitesurfing? "PFFF! This shouldn't even be a question!!! Once you are on the board and u get going there is no going back ? THE most amazing feeling ever; gliding freely and smoothly across the water and being at one with the elements." Music? Honestly most types of music I usually listen mostly reggae, house, electronic, random stuff, latin music like salsa, bachata, and merengue and also some RnB hip hop stuff. Favorite kite/surfing spots for you? Le Morne Mauritius (Surfing) and OVERALL => Cabarete Bay in the Dominican Republic , i'm always in Cabarete because my dad has some awesome places down there check it out; www.oceandreamcabarete.com its perrrfect for anyone coming for a relaxing/party/kite vacation!!! I LOVE it... by far one of the best places for meeting people and having perfect kiting conditions (everyday) in the world!!! How long have you been doing this? Started kiting when I was about 12 but then stopped because I no longer lived near the ocean. I just got back into it about 2 years ago and im really happy I did. Why kite/surfing? PFFF! This shouldn't even be a question!!! Once you are on the board and u get going there is no going back ?you are hooked!! THE most amazing feeling ever; gliding freely and smoothly across the water and being at one with the elements. What does your family think of this? They LOVE it. I owe it to my dad who got my hooked onto kiting. My dad has been kiting ever since the beginning of the sport. I remember seeing it the first time in Hawaii at Kalua Bay when I was about 7-8 years old. What does this sport mean to you? This sport represents the pure essence of freedom and nature... I just love how this sport is all natural no motors no engines etc. As much it is an extreme sport it is an art. Vision...you wishes for the future : To see my self in Kiteworld magazine one day, no cover but just some article would be sweet!